Order your Faber-Castell NEO Slim Stainless Rollerball today from FahrneysPens.com. Fine Pens, Refills & Luxurious Gifts – great prices & fast shipping. The Faber-Castell NEO Slim is for those who love aesthetic design, meticulous craftsmanship and premium materials. The streamlined profile makes a distinctive statement in cutting-edge matte stainless steel finish with bright chrome-plated accents including the spring-action clip and elegant fountain pen nib in steel. 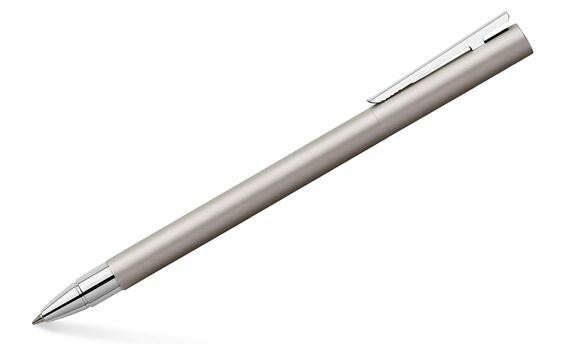 The twist ballpoint pen comes with a stylus under the end cap for your digital touch screen needs. The capped rollerball has a smooth gel ink for swift writing. More NEO finishes are available on our website. Cartridge/converter fill.